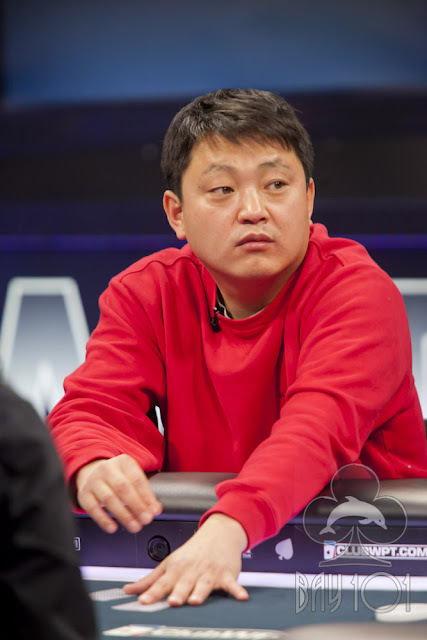 On a [Ac][9h][2s], Joe Elpayaa bets 80,000 before Moon Kim check-raises to 180,000. Joe called, and the turn fell [4c]. Moon bet 200,000 and Joe made the call. The river fell [7d] and Moon once again bet, this time 600,000. Joe went deep into the tank and eventually folded A-K face up. Moon showed his [Jh][8c], which was a stone cold bluff, and Moon overtook the chip lead with that hand.